Weight [including 5 wheels and tires]: 5315 lbs. Wheels: forged aluminum and steel, 15.0 inches diameter. 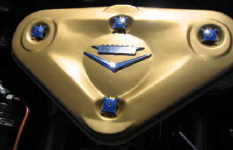 with "Brougham" nameplate and "V"
Wheels: Kelsey-Hayes slotted disc with wheel covers, 15.0 inches diameter.